On August 29, MGM organized over 30 team members to visit Hengqin, exploring the new model of cooperation between Guangdong Province, Hong Kong and Macau. On August 29, MGM organized over 30 team members to visit Hengqin, exploring the new model of cooperation between Guangdong Province, Hong Kong and Macau. They were warmly welcomed by the Macao Affairs Bureau of the Zhuhai Hengqin New Area Administrative Committee. The visit engaged team members who completed the MGM PRIDE talent development program. It helped them better understand the latest development in Hengqin and seize the opportunities brought about by the Greater Bay Area initiatives. 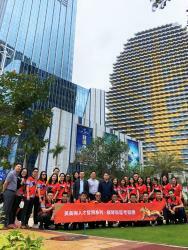 The group first visited the observation deck at the Hengqin Headquarters Tower to inspect Hengqin’s urban strategies and planning systems, and then went to the Hengqin New Area Construction and Development Planning Exhibition Hall which showcases the Hengqin’s history, development progress, future planning, and more. Their visit also included tours of other large-scale projects such as the Xiangzhou Port Culture Block, one of the major cultural projects in Guangdong Province, and the Traditional Chinese Medicine Science and Technology Industrial Park of Cooperation between Guangdong and Macao.